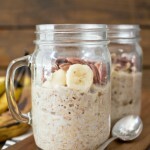 Banana Nut Overnight Oats are a delicious and easy start to your day! This post is sponsored by The Quaker Oats Company, but all opinions are my own. Hi friends! What’s your favorite meal of the day? Hands down, mine is breakfast. It’s the one meal I look forward to every single day. 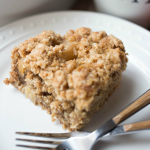 There’s always a cup of coffee and a lot of the time there is oatmeal involved too! That’s why I’m so excited to announce that I’m going to be sharing some of our favorite Quaker products and recipes with you this year. It’s such a natural fit for us because my family truly loves Quaker Oats products. Now that we’ve hit summer temperatures here in sunny Phoenix, AZ we’ve changed up our breakfast oatmeal game and traded in our hot bowls for refreshing overnight oats. 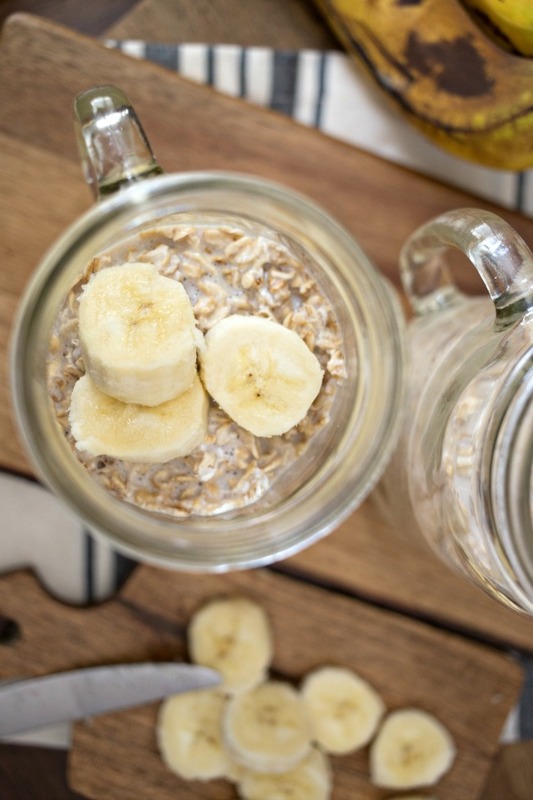 I’m no stranger to overnight oats and today I’m sharing one of my favorite ways to enjoy them – Banana Nut Overnight Oats! 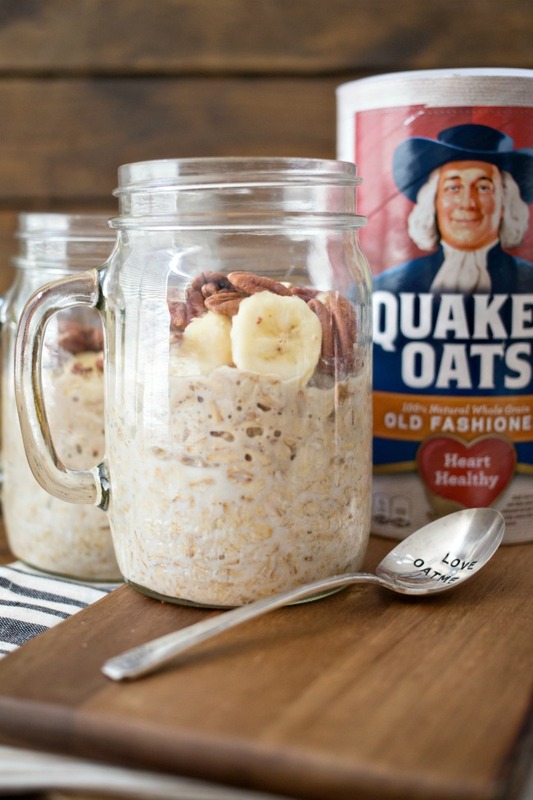 We started with a classic – Quaker Old Fashioned Oats – they do really make for the best overnight oats! You can use any milk product you’d like with your oats but after making my rounds, I found that I prefer vanilla almond milk. I’m a standard milk drinker by trade, but my husband and son are lactose intolerant so we always have plenty of almond milk on hand. So I happened to try it once in my oats and I have to say, I’m hooked! I also add a dash of cinnamon with the oats and almond milk, mix it all up in a mason jar (my overnight oats vehicle of choice), top it off with a lid and let it set overnight. Then in the morning I have a beautiful jar of overnight oats! Really this is a great base for any flavor combination, but I’m a big believer in bananas for breakfast. For as long as I can remember I have added bananas to my oatmeal. 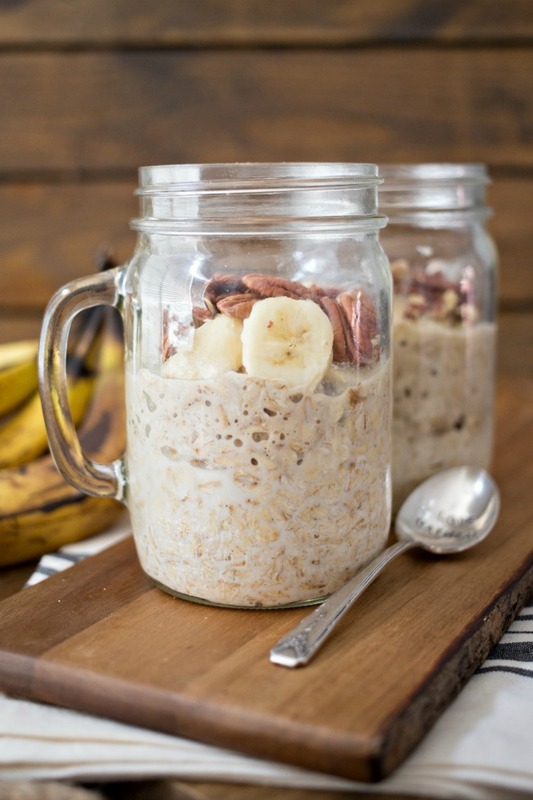 So for these Banana Nut Overnight Oats I add slices of banana and chunks of pecans to top it all off. Add Quaker Old Fashioned Oats, vanilla almond milk and dash of cinnamon to a jar, stir and refrigerate covered overnight. 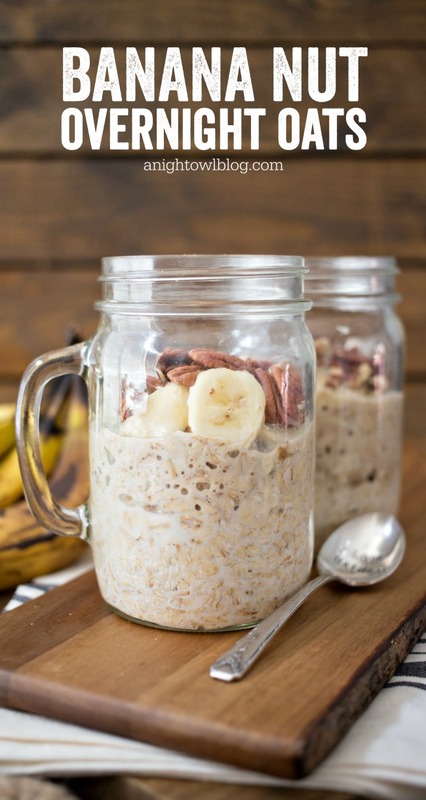 In the morning, top oats with sliced bananas and pecans and enjoy! 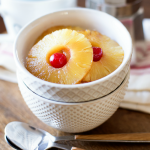 Such a simple, yet delicious recipe. 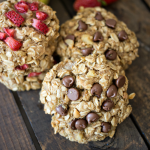 It all starts with using quality ingredients, so make sure you’re picking up the best that oatmeal has to offer. What is your favorite way to eat overnight oats? 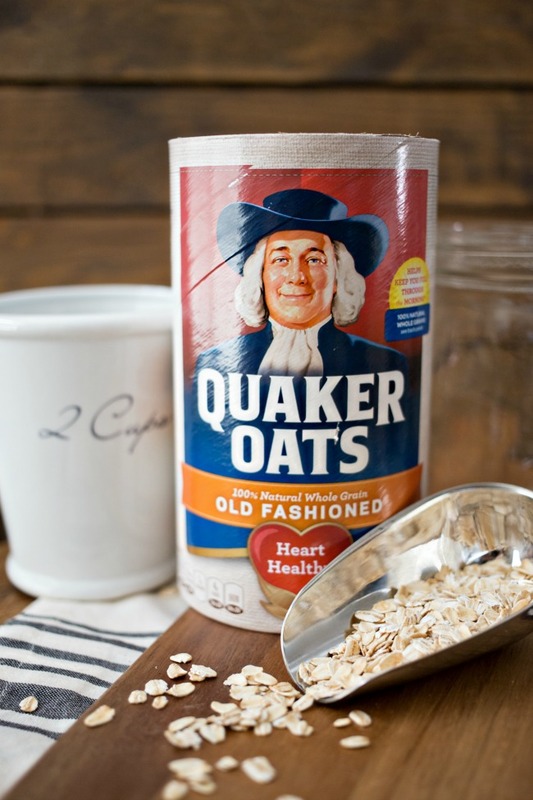 This sounds amazing….I love oatmeal..(it has to be Quaker Oats)..I can’t wait to make it tonight for breakfast tomorrow! Thanks for sharing. I have a question….Do you warm up the oats in the morning? That’s a great question, Christine! You can actually eat them cold OR heat them up! I personally like them on the cool side during hot summer months, but it’s totally up to you. 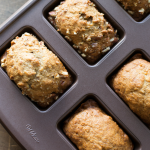 If you want to warm them you can pop them in the microwave in a microwave-safe container for a bit and you’re ready to go!